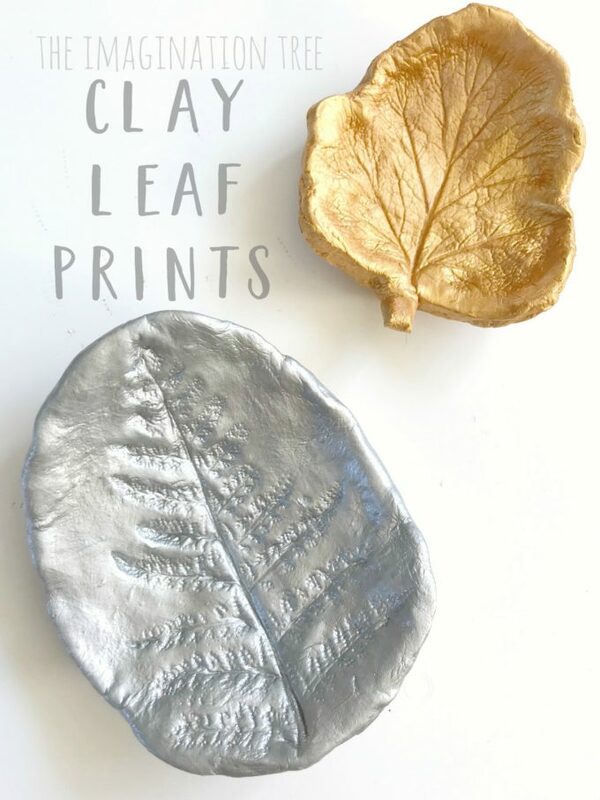 Make some clay leaf print art to use as shallow dishes or relief sculpture for display! 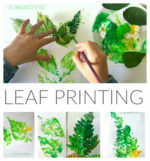 Easy and effective enough for all ages to enjoy and be involved in and a wonderful way to explore nature through art. 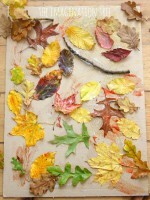 This is such a lovely, simple nature craft that’s lovely for Autumn and Spring in particular. 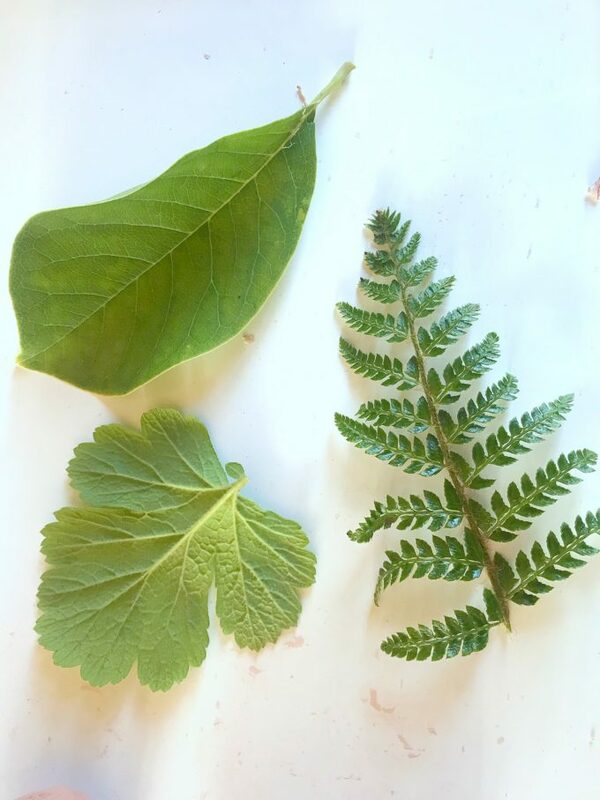 It’s great as part of a topic exploring the shape and patterns in leaves and can be done by even the littlest hands with a bit of help. It’s particularly good for a group project as the pack of clay can be shared out into many pieces for everyone to have a go at the same time. The metallic paint is what makes these look so fab so I’ll link the type we used in our products list below. First go on a nature walk together to search for leaves that are a variety of shapes and sizes, (taking care to avoid any that are poisonous of course!) Look out for leaves that have well raised veins as these will make clearer imprints in the clay. Look at the leaves together and talk about shapes, edges, patterns, number of individual leaves off the stem and the vein directions. 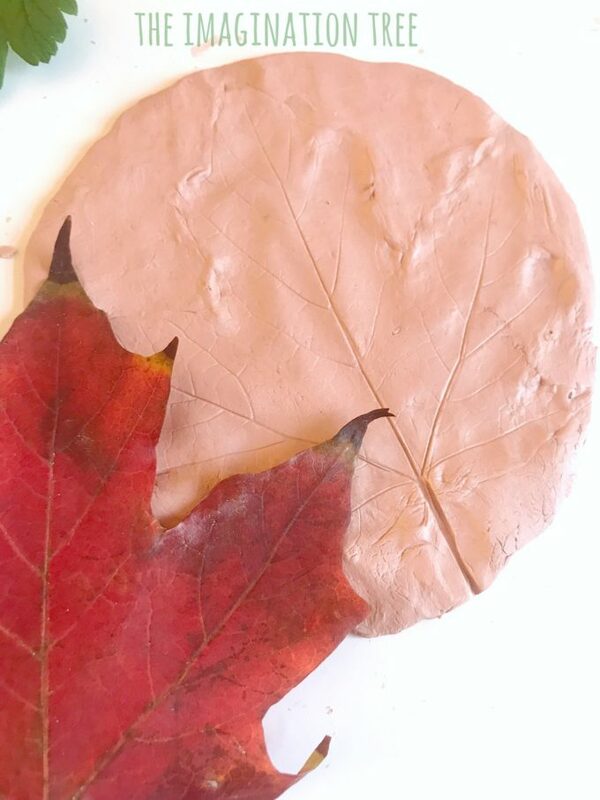 Then choose one leaf each to work with and make a rough estimate of the amount of clay needed to fit the leaf on for making an impression. Divide up the clay and encourage the children to work it for at least 5 minutes to soften it ready to use. Don’t skip this step or else the clay will dry and crack easily. It’s also a fantastic fine motor muscle strengthening work out which is hard to replicate with any other materials besides clay! 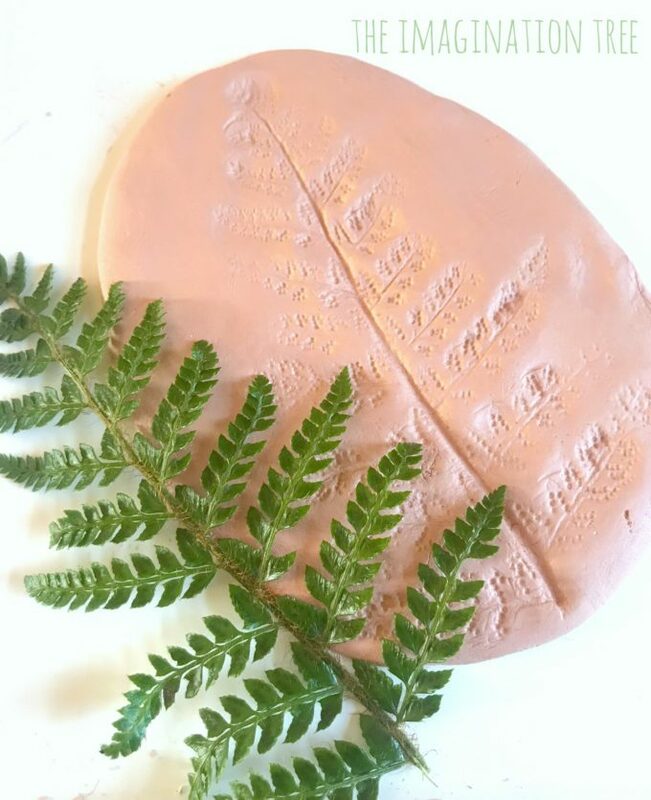 When soft and pliable enough, roll the clay into a ball and then use a rolling pin to flatten it out into a disc. I’d recommend it is not thicker than 2cm or else it will be hard to shape later. When happy with the disc shape and size, check that the chosen leaf will actually fit onto it, and then place it carefully down onto the surface. 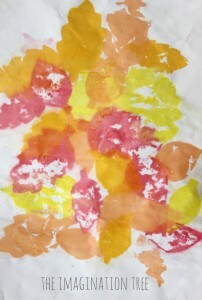 Press it lightly all over the leaf, especially at the edges and along each ridged vein to create enough definition. Then simply peel it off again! 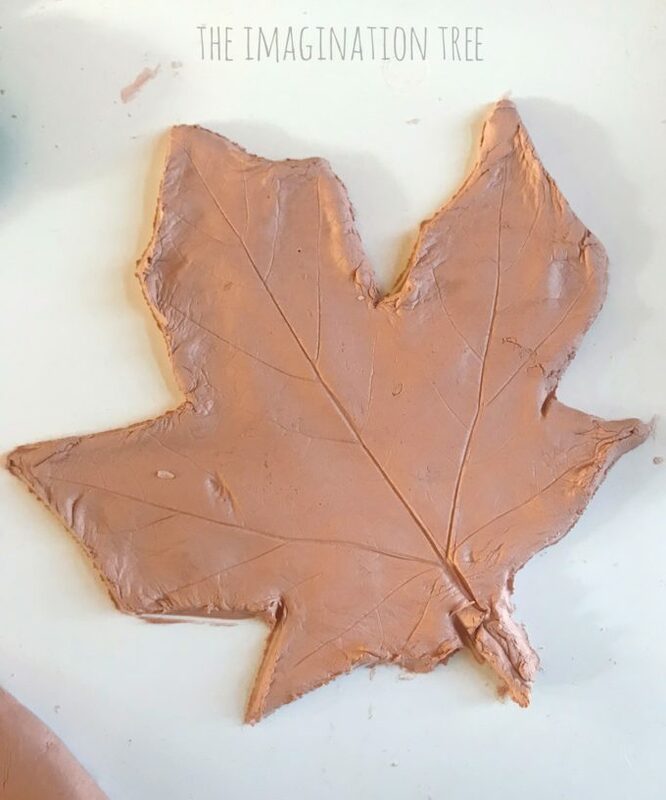 Use a clay tool or a blunt knife to cut carefully around the outline of the leaf and use the trimmed off clay for another project. 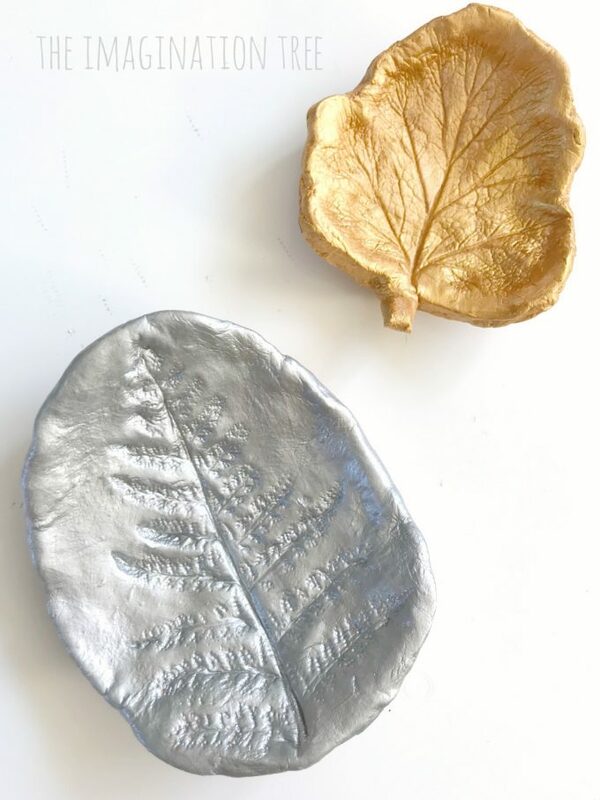 This step is optional as the leaf imprints also look lovely within the disc itself, so decide if you want the finished product to be entirely leaf shaped or not. You could do one of each maybe! 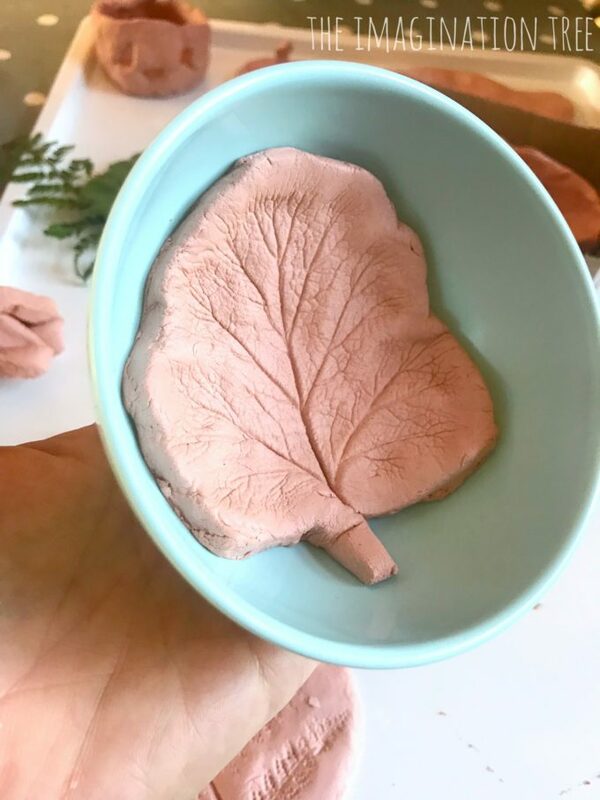 With some of our leaf clay shapes we then set them inside a shallow bowl to turn up the edges and allowed them to dry and harden in a slight dish shape. Again, this stage is optional and we made some of ours this way, allowing others to dry flat instead. Both look lovely when complete! Leave them to dry (out of reach if you have toddlers around!) and within 1-2 days they should be absolutely hardened and ready to decorate. Simply apply 1-2 coats and leave for an hour or so to dry and they’re done! 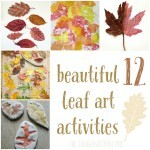 I love both versions of our clay leaf print art projects, with the trimmed edge and without. They are currently displayed on our mantle-piece as beautiful nature seasonal art but they could also be used to hold precious trinkets or even be mounted carefully inside a box frame and hung on the wall. They’d need a strong glue to make this possible but it would definitely work, especially if the leaf print is thin enough to be fairly light weight. 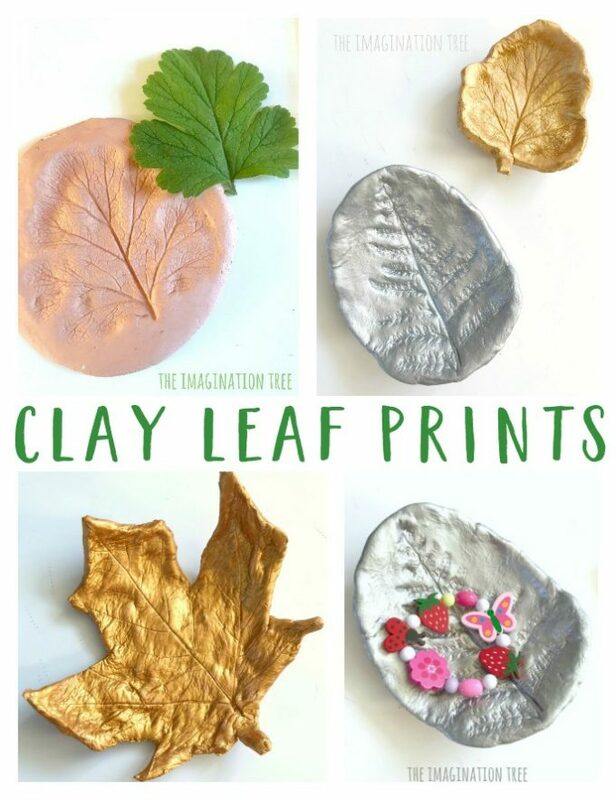 Love this idea but want to make your OWN clay/ imprint material? 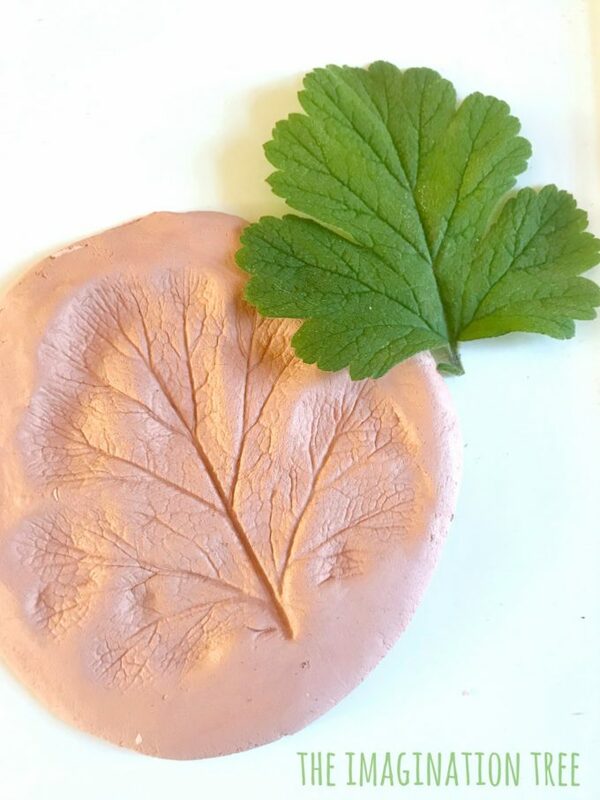 Try our SALT DOUGH LEAF IMPRESSIONS idea which is different but oh so adorable too! 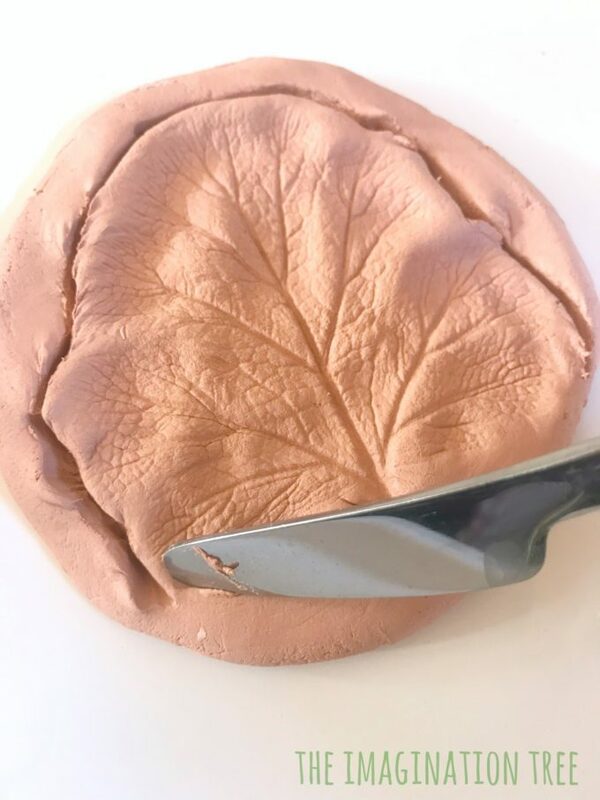 These CINNAMON SALT DOUGH LEAVES are another fun spin! 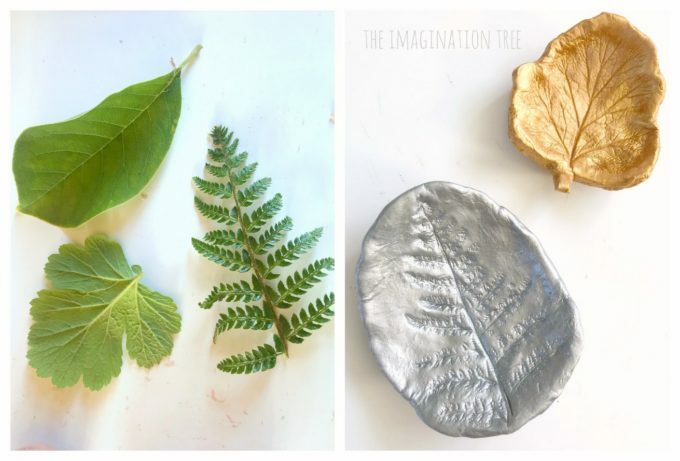 If you loved these clay leaf print art sculptures please could I kindly ask you to share with friends and colleagues on social media? 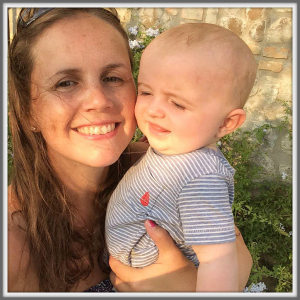 And please do leave me a comment so I know that you’ve tried it and loved it too! 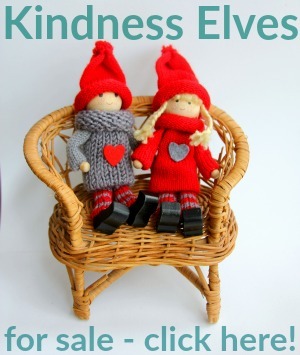 I LOVE seeing your creations that are inspired by my posts! 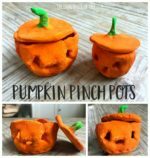 Looking for more CLAY ART ideas? Check the archives link. Want more NATURE PLAY & CREATIVITY ideas? Click to browse! And here are the AUTUMN PLAY archives too!